Do you have a lackluster or faded gemstone? Chipped or cracked gemstone? Sad looking gemstone? That’s not right. And you’re probably avoiding wearing it because it doesn’t look like it should! 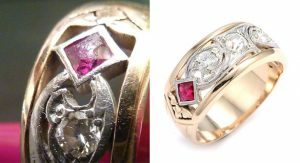 As a busy gem fixing jeweler I’ve had the opportunity to work on some fun projects, that led to great before and after pictures. I’ve used these pictures again and again to inspire changes for the better for my clients. Now I want to inspire you. Change, fix or re-polish your gems! I got so excited I did a video on faded gemstones, cracked gemstones and garbage disposaled gemstones. Over time, some gemstones lose their vividness of color. Quartz family gems are especially vulnerable to this problem. Rose quartz exposed to sunlight can lose its pinkness fairly quickly. Morganite and Kunzite are often referred to as “evening gems” as their colors are delicate and sparkly and look good at night. Worn in daylight, however, they can slowly fade. Amethyst can also lose its color but is more stable than rose quartz. More on this. Alison’s Old Amethyst with it’s Faded Color and Her New One! 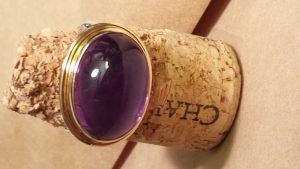 She was over the moon when I presented her with her grandma’s ring with a big, new, brilliant amethyst in the center. The difference was spectacular. “This baby’s not living in the bottom of my jewelry box anymore!” she exclaimed. Replacing old, scratched, and faded gemstones is easier than you think and can make a huge difference in your jewelry. My client Carol thought her green gem was just dirty. When I looked under magnification I saw it wasn’t dirt dulling that beautiful gem, it was scratches that robbed it of its beauty. 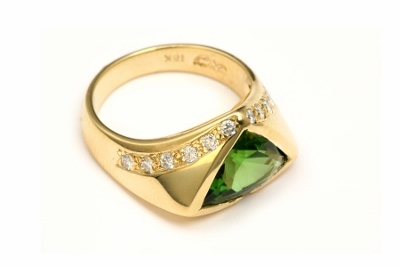 Once we refaceted her Tsavorite, and polished up her ring, it looked incredible again. 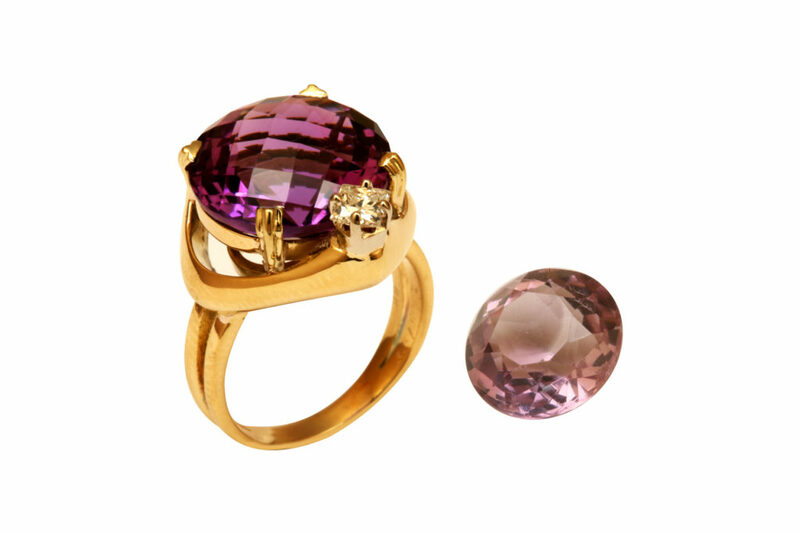 A gemstone with sharp facets can turn an old and dull ring into a new, bright and fun ring that you’d be proud to wear. Marra loved this ring. Her only problem she told me was that she couldn’t clean it up to the way it used to look. “There’s like a film or something dulling it.” She explained to me. When I inspected her gemstone, I had to tell her, that’s not a film, it’s a network of scratches. I’d need to re-polish it. The next time you think your gemstone is dirty, look under magnification. It may need to be polished or re-faceted. Tsavorite is a funny gemstone. It is strong. You can bang it around and it won’t easily crack. However it will scratch fairly easily. 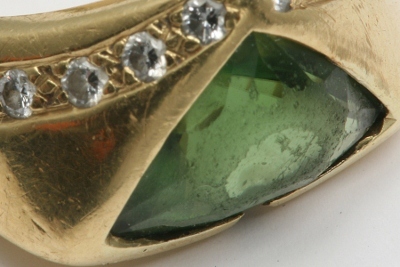 Here’s a man’s ring with a great example of the scratched tsavorite before and after re-polishing. It comes back full of life and fire. 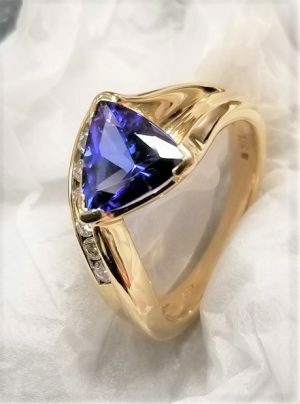 When Tansy wore her ring daily she had no idea that she could badly scratch her beloved Tanzanite. 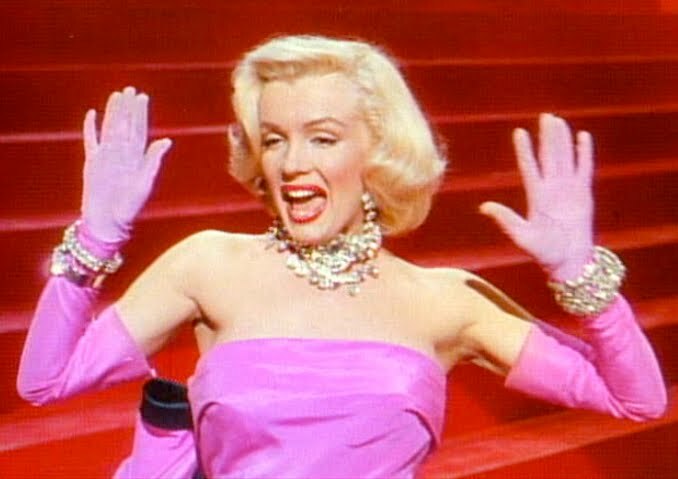 She had not been told when she bought it that tanzanite wasn’t a great everyday gemstone. It’s a bit delicate and Tansy’s life was anything but. 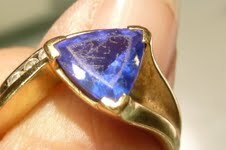 Tansy got the tanzanite ring because it is as she calls it, “my tansy ring.” I encouraged her not to wear it daily. But she probably will. And that’s cool. Now we know how to keep it looking amazing. 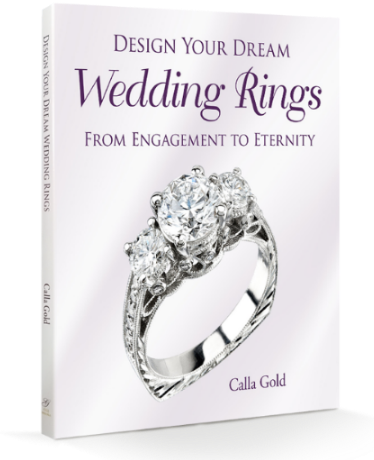 Go through your jewelry box and see if there are any rings or pendants whose color isn’t making you want to grab it and put it on. Or if one of your gems looks tired or just done. Now visualize this piece of jewelry with a vibrant new gemstone in it. Ok? Now call your favorite jeweler! It’s time for a little jewelry rescue! I love that jewelry and gems can be refurbished. 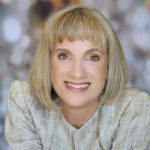 I often look at older jewelry that has the right style yet needs a facelift. Calla it’s good to know you are a Santa Barbara jeweler and able to give old jewelry another chance. I love the idea of jewelry facelifts;it’s glamorous, blingy and just good jewelry recycling. Calla, I’ll adjust your back and you can adjust my old jewelry! Your video is very professional, while capturing your personality! One tiny suggestion – show the jewelry before and afters a little longer each, then maybe side by side briefly. Really well done videos Calla! I work with Jonathan at Jonathan’s Jewelry and I love your site and your work! I only wish I had some jewelry left for you to redesign for me!! Keep up the good work with your blog, I am enjoying it!! I wore a cats eye about 2 months back. few days back i saw that it has developed a small crack. please tell me what should i do with it? I live in Los Angeles on the west side. 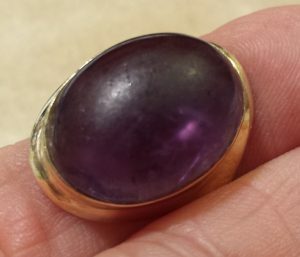 I have a kunzite that has faded and I want to know if it can be dyed, and if you know of anyone who can do it. I also have a pink rhodolite garnet that has just gotten dull and seems as if it may have faded. I’m hoping the stones can be restored. I am wearing a ruby for the last two years. I find its surface appearing very rough nowadays. Should I continue wearing that stone? Will it have any bad effect on me? Why did the surface get rough? How did it get damaged? My boyfriend recently (1 month ago) bought me a gorgeous 6 carat smokey quartz ring. I was cleaning it recently with a soft cloth and noticed that it now has several hairline scratches on the surface. Is this something I can buff out myself or should a jeweler do this? I also wanted to mention that I was surprised at how quickly the quartz got scratched considering its hardness! Any help or advice is much appreciated.